The CDU Campus is located on Ellengowan Drive, Casuarina, approximately 12 kilometres from the Darwin CBD. It has good public transport links with a bus stop on campus. 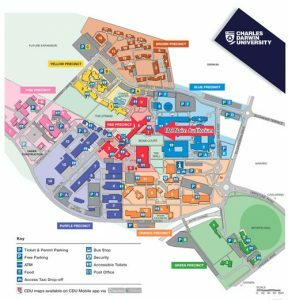 The campus is well signposted according to precinct colour and building numbers to assist in navigation. Taxi – approximate fare $35. Bus – number 4 public bus stops on campus. The journey takes about 35 minutes from the bus interchange in the CBD.